Evaporative air coolers are a very good energy efficient alternative to classic, freon air conditioners. In fact, our own bodies are cooled by transpiration through the same evaporative cooling effect. A New Jersey startup named Quilo is launching these days the device that they say will revolutionize cooling energy efficiency. 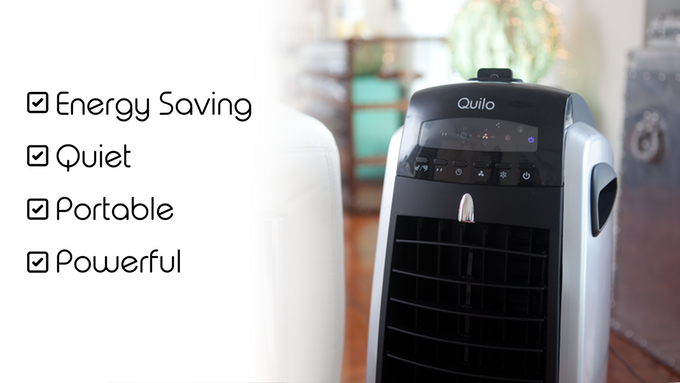 Quilo is an evaporative air cooler and humidifier that’s powered by a simple fan – yes, the least energy consuming cooling system on the planet. It takes hot air from its surroundings that it uses to heat up water. Then, mists pass through the air stream exiting the fan and cool down a radiator which further condenses the water mist coming from beneath, and the process repeats itself. All of this evaporative cooling effect can be augmented by putting ice on top of Quilo and further cooling down the radiator for an increased condensation and cooling effect. What’s more interesting about Quilo and water-based coolers in general is that the air coming from it is humid, not dry, and helps with allergies by trapping pollen and other harmful chemicals inside it, making them less harmful and less prone to enter your lungs, to cause allergies. One other positive effect of air humidifying is skin hydration, which is especially useful in winter, when cold weather dries out the air and cracks your skin. The active carbon filter in Quilo cleans up the air in your room, further enhancing its intrinsic pollen-trapping capabilities. Usually, freon compressors and regular air conditioning devices are loud. 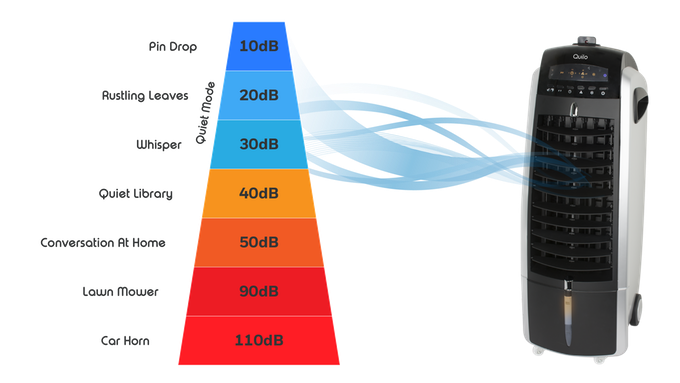 Quilo’s creators claim that their device can operate at whisper-level sounds, while still lowering room temperature by 10 to 15 °F. This happens because of the design of the fan motor in Quilo, which has the same brushless technology used in laptops and other ultra-silent electronic devices. One of the most important advantages of evaporative cooling is that it leaves money in your pocket, unlike traditional, power-hungry air conditioning devices. 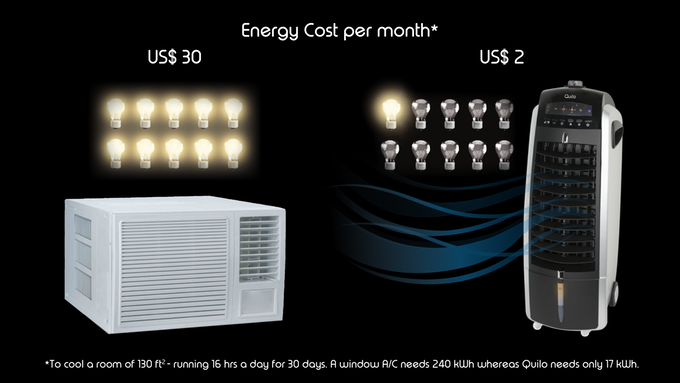 For example, in their Kickstarter campaign that just started yesterday, Quilo developers state that to cool a 130 sq-ft room for 30 days, running 16 hours a day, their device only needs 17 kWh, while a traditional air conditioner would need 240 kWh, which translated into money means $2 vs $30. Freon and other types of CFCs have been at the heart of long international debates and even participated in the famous ozone hole that’s been hurting our environment in the ’80s and ’90s. Nowadays, refrigerators don’t use freon, but even the more benign HCFCs used in refrigerators and air conditioners nowadays still hurt the environment and their release in the atmosphere contributes to climate change. Read more about refrigeration and CFCs in this Wikipedia article. Quilo doesn’t have freon or any other of HCFCs, simply because it uses a principle that’s as natural as your own transpiration in hot summer days. Its carbon footprint is so low that you could power just a light bulb in a month of cooling. Quilo has been built with portability in mind, and that’s why its makers have adopted a mobile design. You can carry Quilo almost wherever you need it to cool you down, while keeping energy consumption at a minimum. Quilo’s creators have collaborated with an award-winning German design agency. “The internal construction from the grooves in the walls to the curve of the fan blades, was carefully engineered to maximize airflow travelling throughout the system,” says their Kickstarter page. All in all, evaporative cooling is about to see a comeback these days if these guys’ Quilo Kickstarter campaign succeeds. The price is also competitive with any other classic air conditioning device, and even cheaper. They still have the early-bird option at $99 and the normal price at $119, which are both a bargain, considering all the benefits enumerated above. You can get your Quilo from here. 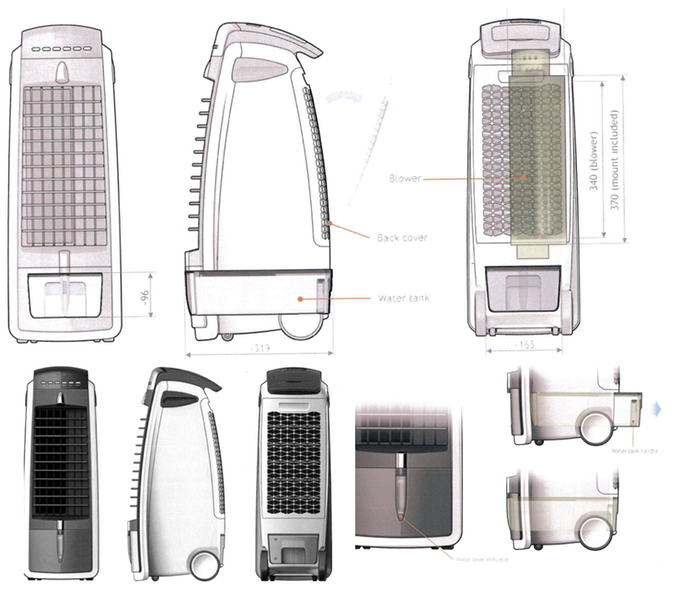 Disclosure: Quilo’s team helped with the creation of this article, but we accepted and wrote about it only because we believe in the evaporative cooling technology and its benefits. We honestly want them to succeed with their project.